Fall is my favorite season to spend in the kitchen. More specifically, it’s my favorite time of the year to bake. I don’t bake very much, since that would naturally lead to the consumption of said baked goods. But for the fall, I make an exception. I spent the afternoon baking these pumpkin chocolate chip cookies. They are soft and cakey, with the right amount of crunch around the edges. They have a great spiced pumpkin flavor, and the chocolate adds a wonderful twist. They pair well with coffee or vanilla ice cream, and are the perfect cookies for the fall season. Preheat the oven to 325 degrees. Line two baking sheets with parchment paper. Stir the flour, baking powder, baking soda, salt, cinnamon, nutmeg and cloves together in a medium bowl and set aside. In a large bowl, beat the eggs and sugar until smooth and lightened in color, about 1 minute. Mix in the oil, pumpkin, and vanilla until blended. Mix in the flour mixture. Mix in the chips. Scoop mounds of the dough onto the prepared baking sheets, spacing the cookies at least 2 1/2-inches apart. Use a spatula to smooth and flatten the rounds. Bake the cookies one sheet at a time until the tops feel firm and a toothpick inserted in the center comes out dry, about 18 minutes. Cool them on the baking sheet for 5 minutes, then transfer the cookies to a wire rack to cool completely. The cookies can be stored in a tightly covered container at room temperature for up to 4 days. You know I wouldn’t have thought pumpkin and chocolate would go well together but those look so darn good I might have to try them! DEEEElish!!! I’m totally gonna try this one out! These are one of my all-time favorite cookie!! As soon as I saw the title of the post, I could smell the memory of them baking in my Mom’s kitchen.Mmmmmmmmmmmmmmm. Mmmm that looks soooooo good! 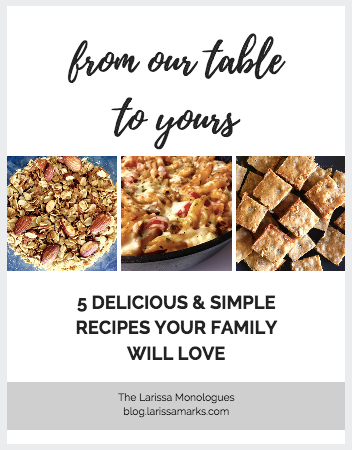 larissa, i am loving these recipes of yours! can’t wait to try this one. I love this recipe! My friend actually just brought some of these cookies into work yesterday. Yum! i need those cookies in my life RIGHT NOW. Please email me for my home address. I must make those right now! !I made pumpkin cookies the other day, only used a sugar glaze on top and got rid of the chocolate chips. They came out well! Okay – my mouth is fully watering and I am dying to make those!! I am going to this weekend! Those look so super good. I’m going to have to try it. Such an interesting recipe! The cookies look so good. Pumpkin and chocolate – wow, would have never thought they could go well together, but apparently they do:) Thanks for sharing the recipe! Oh my. Those look DELISH. Bookmarking, saving for later! I sure am enjoying all these Fall-time recipes that are out and about now! The cookies are so pretty and I bet they smelled wonderful baking. I’m pretty sure I made these years and years ago in my grade eight cooking class. I still remember them being quite possibly the best cookies ever.I’m actually going to make these sometime this weekend. 🙂 Thanks for sharing! You’re making me wish I liked pumpkin because those cookies look absolutely divine! 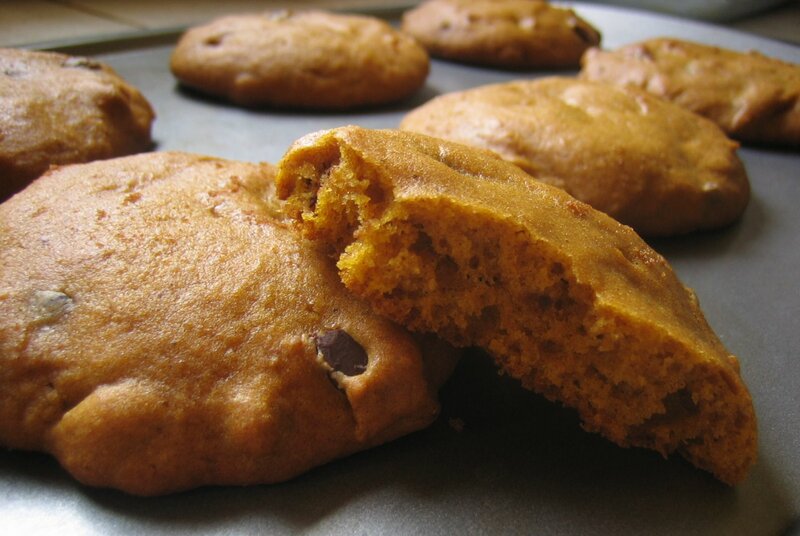 thank you for this recipe…i actually have been baking a lot of pumpkin goodies lately, and I have actually been thinking that a pumkin cookie would be awesome…so, i guess I know what I will be making today! I made these cookies last week and they are delicious. I took a few to work for my co-workers to try. They were a hit. I’m going to make them for our cookie exchange in a few days!